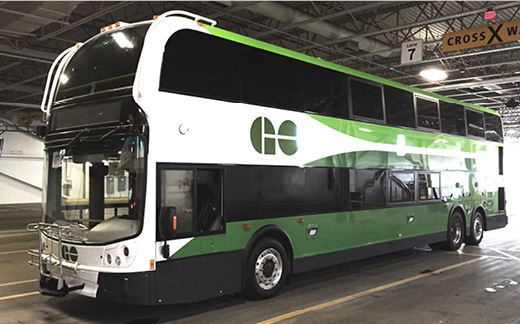 Our new buses and train cars are in service to make your trips more accessible and comfortable. We've put new low-height, low-floor double-decker buses in service, and we've started putting hundreds of new train cars in service too. By 2020, we'll have a total of 253 buses and 327 new train cars. More leg room, and more space between and underneath seats for bags and luggage. 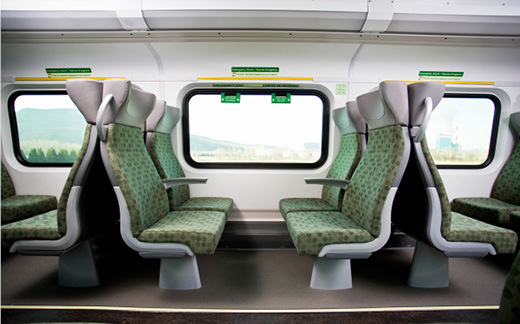 Thicker cushions on the seats and head rests, and moveable arm rests. Washrooms with electric hand dryers, and touchless faucets and soap dispensers. Additional floor heat to keep temperatures warmer during the winter months. Floors that decrease the train's noise, for a quieter ride. Softer lighting that is easier on your eyes. Doorways without a centre pole that allow for more space when getting in and out of the train car - especially with strollers and bikes. Lower floors, and a longer, more gradual ramp for easier boarding and exiting. Two wider areas for maneuvering with mobility devices. Eight electrical outlets (4 on each level), with 2 in the wheeled mobility device area. Automated next-stop announcements and visual displays for consistent and timely information. More space to store your luggage. Reclining seats on the lower floor. Tinted windows for increased UV protection and temperature control.